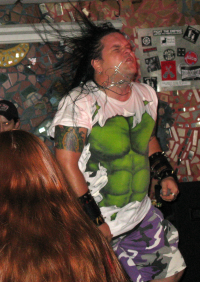 Tonight we’re going to look at one of Charleston’s hottest punk bands from a few years ago, The Concept. Originally a trio consisting of Mike, Dave and Ross, the band added Bryan and became a powerhouse punk band. With rumors flying that the original line-up of the band, plus Bryan, will be reuniting soon, se though it’d be a kick to look at one of their music videos (above) and two installments of a video blog that I produced for the band more than three years ago. For some odd reason, hardly anyone has watched part two of the video blog, which is way funnier. Watch PopCult for details on the return of The Concept. Your PopCulteer is still trying to skate through July while on a semi-vacation. After delivering four hours of Radio Free Charleston to PopCult readers in two weeks, a well-earned period of rest became a priority. However, the best-laid plans thing did kick in, and rather than have a few weeks of relaxation and slacking off, your loyal scribe has been busier than ever with a myriad of surprise projects and lovely household incidents, not the least of which has been an over-active dehumidifier on my central air system that sort of gave me an indoor pool for a few days. So instead of a big wordy PopCulteer this week, you’re going to get a photo review of last night’s Heart Of Appalachia Roller Derby fundraiser. It was a great night, raising money to help fund the Clash In The Coalfields multi-team scrimmage and Benefit on August 27 at the Madison Civic Center. At the Clash, 20% of the door goes to the medical fund of a local boy diagnosed with leukemia, and concessions sales will benefit Rev-Up Madison, so it’s all fo a good cause. The night kicked off with the hysterical song stylings of Pete Kosky. Then RFC fave, David Synn took the stage with his bank of keyboards to create some amazing soundscapes. The Rendfields arrived from Transylvania just in time to whip the crowd into a frenzy (some of which you’ll see next month on Radio Free Charleston). HARRAH (seen above) closed the night, keeping the crowd hot and happy well into the wee hours. Starting tonight The Contemporary Youth Arts Company will present Boxes 14: The Dead Girl Speaks. 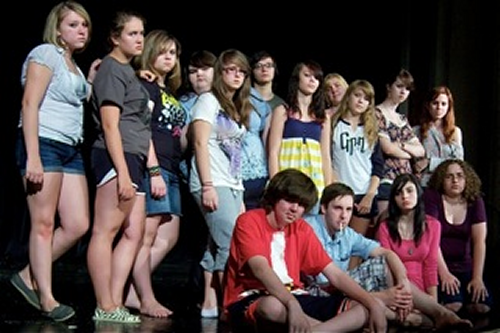 You can see this collection of monologues, performed by some of the area’s most talented young performers, Thursday through Saturday, July 28-30, at 8 PM on stage at the WVSU Capitol Center Theater, 123 Summers Street, Charleston. A collection of stories and monologues about the issues confronting young people today, the drama, written by Dan Kehde, features individual performances by fifteen rising stars of the local stage. Samantha Oxley, Daniel Calwell, Kelsey Hall, Daisy Thomas, Emilia Samosky, Celeste Vingle, Lauren Miller, Kaylen Surface, Susanna Morris, Katy Shaver, Austin Lowe, Haley Arthur, Eli Chambers, Mariah Plante and Rowan Maher will present this year’s collection of hard hitting, funny, poignant, and honest stories and monologues of moments facing their generation. This is the fourteenth installment of “Boxes” put on by CYAC. Supporters of live theater should make it a point to come out and see this terrific work. Tickets, $6.00 for students, and $10.00 for adults, are available at the door prior to each performance, or by calling the theater box office at 304-342-6522 during regular business hours. Tonight the Empty Glass introduces the the Kanawha Valley’s newest women’s flat-track roller derby team, Heart of Appalachia Roller Derby! Performing at the lovely ladies’ first EG fundraiser are Pete Kosky, David Synn, the Number 6, The Renfields (with an acoustic set) and HARRAH. You’ve seen HARRAH and David Synn on Radio Free Charleston, and the other acts have been on our radar for future RFC appearances for some time. Many fine merchants from all over the Valley have donated their goods and services for raffles to be drawn all night long. Plus, there will be jello shots, including something called “Heart of Appalachia Roller Derby shot.”. The show kicks off at 8 PM tonight at The Empty Glass. The cover charge is five dollars. 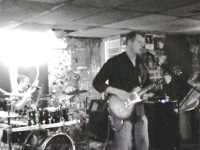 Check below for videos of David Synn and HARRAH. 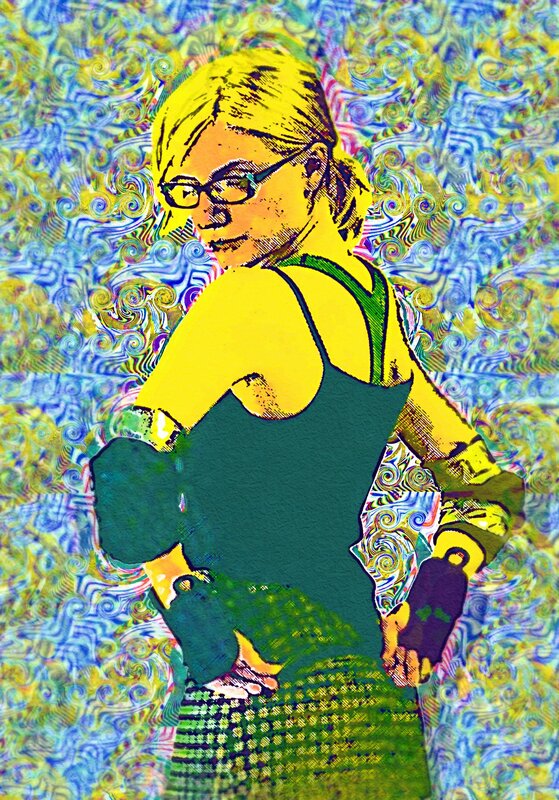 This week’s artistic jolt of virtual caffiene is a digital painting of Cait Cool, based on a photo I took last week at Dr. Sketchy’s Anti Art Show. Cait is a roller derby girl from Huntington, and this painting is a little bit of my dimestore psychedilica. Click the image to see it bigger. Sunday Evening Video: Remember The Winter? Tonight we’re going to take you back to last December with an episode of Radio Free Charleston that might cool you down a bit. Remember how cold and snowy and nasty last Winter was? Well, we could use a little of that cold now. So the cold wasn't so bad after all. “Frank Sinatra Shirt” was the one-hundred fifteenth episode of Radio Free Charleston contains performances from Linfinity, The Nanker Phelge, HARRAH and Crossroads, plus classic Russian animation set to music by Hellblinki. 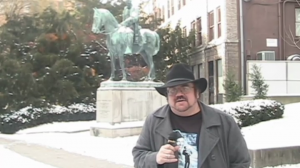 Host segments were shot in Davis Park, Charleston, West Virginia, on December 14, 2010, one of the coldest days of last year. It would be so cool if I could embed this, but you'll just have to follow the link. I will be honest with you. This was not my first pick for tonight’s Sunday Evening Video. 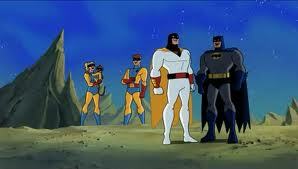 I wanted to post a leaked segment from the upcoming season of “Batman: The Brave and the Bold” where Batman teams up with Space Ghost. Sadly, embedding has been disabled for that clip, so you have to go watch it here. The Hottest ArtWalk In History? I don’t know if anyone has kept records, but yesterday’s ArtWalk was held on what was certainly one of the hottest days I can recall. Despite the heat, your PopCulteer made the trek out for a combination ArtLimp/ArtSlog through the humidity. Yes I said “ArtLimp.” I was somewhat hobbled by a mysterious knee issue, so a couple of the galleries were visited by my significant other, RFC Big Shot Melanie Larch, earlier in the day. We also missed a couple of galleries, but we’ll get those guys next month.You have to cut us a break, as the Heat Index says it was the equivalent of 280 degrees or something close to it yesterday. We started ArtWalk last night at Studio 1031, where you can not only find work by Gloria Jean Pennington, Joeann Crawford, Judith Pratt, and Stefani Andrews, but you can also find the artists themselves, hard at work, during the ArtWalk hours. This is one of the coolest studios in town, and is well worth a visit. 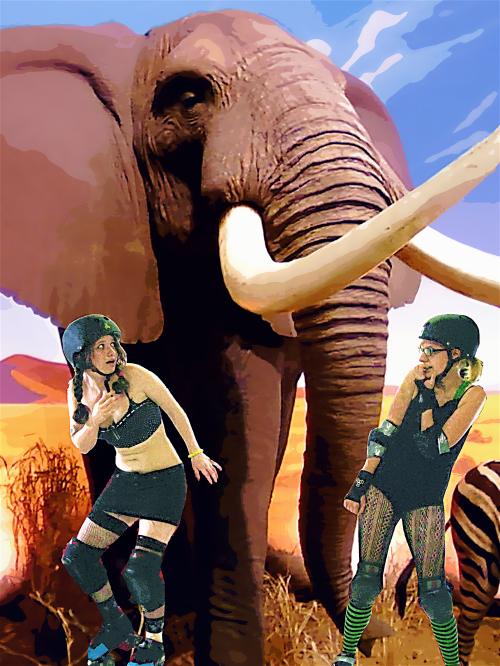 Today’s digitally assaulted photograph/painting combines a shot from last night’s Dr. Sketchy’s Anti Art Show (with a Roller Derby theme) with a photo left over from my trip to Cabela’s last month.This depicts Cait Cool and Sarah Lane of the Jewel City Roller Derby Girls and their encounter with the jammer from the Paducah Pachyderms. You shoulda seen the skates on that elephant! Click the image to see it bigger. This week’s video flashback will take us back almost one year ago, for our first post-FestivALL 2010 show, “To The Batmobile Shirt.” This is a particularly strong outing, with music from InFormation, Volt 9000 (a video animated by RFC Big Shot Frank Panucci) and The AK Fortysexuals. We also have short films by Scott Elkins and K.D. Lett. Coincedentally, our next show, which should hit right about the exact one-year anniversary of this show, will also feature InFormation. 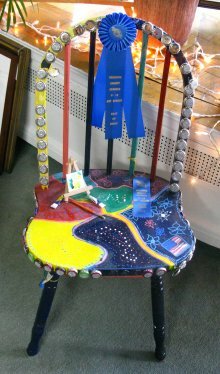 Looking At RFC Milestone Shows, Plus IWA East Coast Photos and More! Your PopCulteer is a tad overworked this week. I have a ton of really great books and CDs to review, but my Summer hiatus from Radio Free Charleston has yet to pay any dividends in terms of free time so far. It’s hard work trying not to work hard. Because of that, today’s PopCulteer is going to consist of some of the milestone episodes of RFC, a photo essay on IWA East Coast’s return to glory last Tuesday in Nitro, and a look at some upcoming weekend events. That is IWA East Coast’s founder father, Mad Man Pondo at the right. 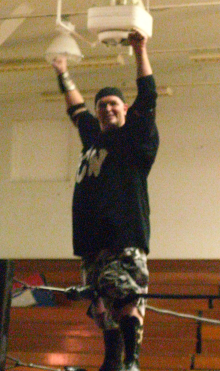 He was in tag team action with his partner, Too Tuff Tony, against the high-flying Irish Airborne.